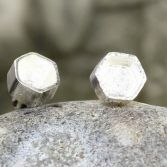 These Honey Goblet studs are unique and have been designed and handcrafted by me. The Goblet Studs are made from solid sterling silver with a textured inside and rim which catches the light beautifully. The cup is a 4.0 mm deep hexagon shaped cup with a funky and contemporary look, and can be worn by male or females. 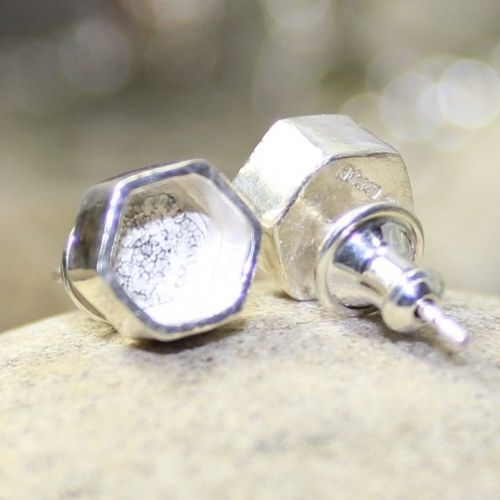 Due to the size of and weight of the cups the earrings are provided with a more substantial sterling silver earring back to ensure they are comfortable to wear. The Honey Goblet studs have been designed and made by me, each pair is hand finished in the workshop. They are made of solid sterling silver and have full UK hallmarks stamped by Edinburgh Assay Office. 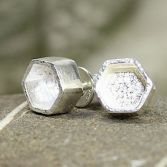 Your Honey Goblet studs will be presented to you in one of our signature gift boxes and posted via Royal Mail 1st class delivery (signed for) to any UK address free of charge.